Want to start your first campaign on Zeropark? This article will take you through the basic setup and requirements you need to start receiving traffic from Zeropark. Before starting a new campaign, make sure you have the following things prepared. Your destination URL: The URL of the page you wish to send the traffic to. Keywords, targets, and geo: It is one of the widely known best practices to be sure beforehand what kind of audience you are trying to reach and how you are planning to reach them. Tracking solution: Tracking is a key point in any successful campaign, therefore it is better to have this set up before sending traffic. There are many solutions on the market, however you might find Voluum is the best option for tracking with Zeropark as it is fully integrated. At first, you must select the traffic source: Domain (redirect), Premium PPV (pop), or Push (notifications). There are available four campaign categories for Domain and Premium PPV traffic. For Push traffic there are three: RON, Target and Source. RON (Run-of-network): Creating a RON campaign is the quickest way to get all the available traffic from a specific country. There are no keywords or specific targets involved. Simply choose your geo, destination URL, bid and your campaign is ready to go. 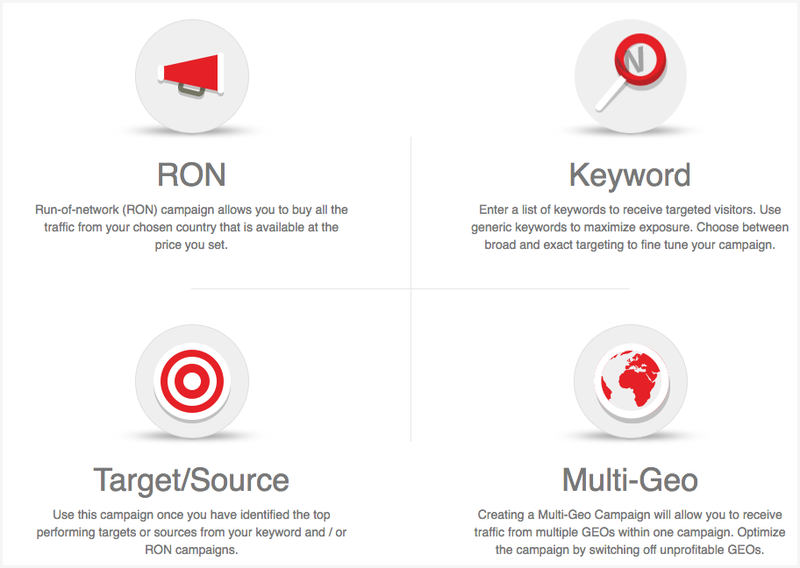 Multi-Geo : The Multi-Geo campaign category allows you to run campaigns in multiple countries through the RON or Keyword campaign types. Target / Source: Select this whitelist campaign category, once you have identified the top performing targets or sources from your keyword and / or RON campaigns. Alternatively, you can create it to add Premium or Selected targets from your chosen GEO. Keywords with exact match targeting: You will only receive traffic from keywords that fully match your selection. If your keyword is “auto insurance”, you will not receive traffic from keywords such as “auto insurance quotes” or “cheap auto insurance”. Or if your URL is “weightwatchers.com”, you will not receive traffic from domains such as “weightwatchers.com/login” or “promotion.weightwatchers.com”. Keywords with broad match targeting: You will receive traffic from all keywords that contain your selection. If your keyword is “auto insurance”, you will receive traffic from keywords such as “auto insurance quotes” or “cheap auto insurance”. Or if your URL is “weightwatchers.com”, you will receive traffic from domains such as “weightwatchers.com/login” or “promotion.weightwatchers.com”. Campaign name: Assign a name to your campaign. Inventory type: Select for the Premium PPV traffic; you can choose different types of Zeropark inventory. Geo targeting: Define the country from which you would like to receive the traffic. Bid: Set the amount you would like to pay per visitor redirected to your landing page. Daily budget: Cap your daily spend or set to Unlimited, if you’d like to receive as much traffic as possible. Target daily budget: Cap your daily spend on a single target or set to Unlimited, if you’d like to keep spending without the limit. Target daily budget: Cap your daily spend on a single source or set to Unlimited, if you wish to get all possible traffic. Traffic buying model: Choose whether you want to Buy Traffic Smoothly with filters in place to prevent campaign overspend or All Available traffic where you will buy traffic without thresholds to prevent overspend. Campaign budget: Cap the total amount that you are willing to spend on a given campaign or set to Unlimited if you wish to keep spending. Target Daily Budget: Choose a cap for how much can be spent on an individual target ID in a 24 hour time range. Source Daily Budget: Choose a cap for how much can be spent on an individual source ID in a 24 hour time range. Traffic Filters: Choose if you want to receive traffic from desktop computers, mobile devices, or both (advanced settings allow you to pick mobile OS and versions, desktop OS, browser, carrier traffic, or specific carriers). Frequency Filters: Choose how often a unique user is allowed to visit your page in a given time range. Traffic type: Choose a type of the traffic that you would like to receive, either traffic from adult or non-adult sources. Day Parting: Choose the hours in which your campaign should run. This is set to the timezone of your account. Destination URL: Provide an URL of your website or landing page where you want the traffic to be sent to. Conversion tracking: Contains all the information you will need to set up a S2S postback for your url. Campaign state after approval: Choose to have the campaign paused or active once it is approved. Once your campaign is set, you need to wait until the campaign coordination team verifies the campaign’s destination URL. Whenever this URL is changed, it needs to be verified. The verification process usually takes up to a couple of hours. Furthermore, if you decide to change the adult filtering, your campaign will also fall into the pending mode. Once you start to see some traffic in your campaign and have enough data you should start optimising towards a ROI goal.